The classical Carlton traditional high level bathroom suite, ideal for creating a luxury period looking bathroom, includes a 2 Tap Hole basin and pedestal set and high level traditional WC pan & cistern. Manufactured from high grade vitreous china in a beautiful white gloss finish. 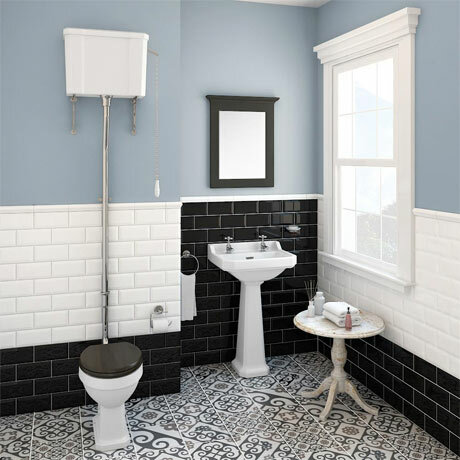 Supplied with a Traditional high level flush pipe pack which includes a high level flush pipe, fulcrum lever, chain pull and ornate cistern support brackets. Create your dream traditional bathroom with the Carlton toilet and basin suite. Some small dimensional variation may occur due to manufacturing tolerances. Please note - taps, wastes and toilet seat shown in photograph not included (sold separately). Q. Taps and toilet seat compatibility? Hi, the seat has adjustable hinges so will fit the hinge positions of the toilet. The dimensions of the seat match up quite well, with the toilet pan so the seat is compatible. The bridge mixer is 200mm tap centers and the hole in the basin are only 180mm so the bridge mixer is not compatible. This sink is recommended for seperate standard basin taps. I hope this is some help, please let me know if you need any further info. Q. Does it have a dual flush mechanism? Hi Terry, this product is a single flush unit. Unfortunately, the manufacturer does not provide a db reading for the volume of the flush. Sorry we couldn't help more today! Excellent service! Product as described!